Cato the Elder was a Roman Statesman during the Punic wars. (“Punic” means “Carthaginian” for reasons explained here.) Cato would end all his speeches with the phrase “Carthago delenda est”, or some variant of it, which means “Carthage must be destroyed!” Even if his speech was otherwise unrelated to Carthage, he would still say that by way of closing. A few months ago, someone pointed out to me that this phrase was “the first hashtag”. I realized she was exactly right, and quickly took to Twitter to tell everyone I knew there who would get it. It’s a great point. This is exactly the right use of a rhetorical device. I hate to say it, but one of Donald Trump’s most successful Twitter tactics is his use of the hashtag #MakeAmericaGreatAgain. Of course, he stole that slogan from Reagan, so he can’t get full credit. But Reagan didn’t repeat it the way Trump does, and repetition is one of the oldest and most successful rhetorical tactics. The fact that Trump has access to Twitter just means his audience is that much bigger. Imagine how Cato the Elder would have use Twitter if he’d had it: everything would have the hashtag #CarthagoDelendaEst. It would look good, it’s simple, and it communicates his point clearly and concisely. Social media makes it possible to broadcast political slogans to millions of people, but the logic behind them is the same as it ever was. It just goes to show you that when it comes to political rhetoric, some things never change. Republicans, such as Karl Rove, have been insinuating that Hillary Clinton is “too old” to run for President in 2016. The Democrats make the obvious reply, which is that Ronald Reagan was even older than Hillary will be in 2016 when he was elected, and the Republicans think he was one of the greatest Presidents ever. Some would say Clinton faces an unfair double-standard in this matter, because she is a woman, and thus people count her age against her more strongly than they did against Reagan. Maybe that’s true. But that’s not the double-standard she should be concerned about. That would be the double-standard I always write about on here: the charisma double-standard. American politics is biased in favor of “style over substance”, and so the most charismatic candidate almost always wins the Presidential election. Ronald Reagan was charismatic; Hillary Clinton is not. This was proven, quite conclusively, by a Senator named Barack Obama in 2008. Bear in mind that I say this as someone who supported Obama over Clinton, but Clinton’s resume was far better than Obama’s for the job of President. Yet he won, because he was a more likeable individual. Hillary Clinton is–Obama’s claims to the contrary–not likeable enough. Mitt Romney had the same problem. So did John Kerry. Pretty much every Presidential election since since 1980 has come down to the question of who is more likeable, which, since most voters never get to meet the candidates in person, is in turn determined by charisma. Now, you may say, this seems unfair to Hillary Clinton. Yeah, it is. It’s kind of silly to pick a President based on something so nebulous. But what else can we do? You can dedicate your life to studying politics and still get everything wrong. So, the average person doesn’t have time to meticulously examine every facet of politicians. They just vote based on who “seems better”. Hillary Clinton never had charisma. Her husband did, which is probably why they have made such a successful team–she has the brains, he has the personality. So, does this mean she can’t win the Presidency? Not necessarily. The Republicans seemingly have no charismatic candidates lined up. 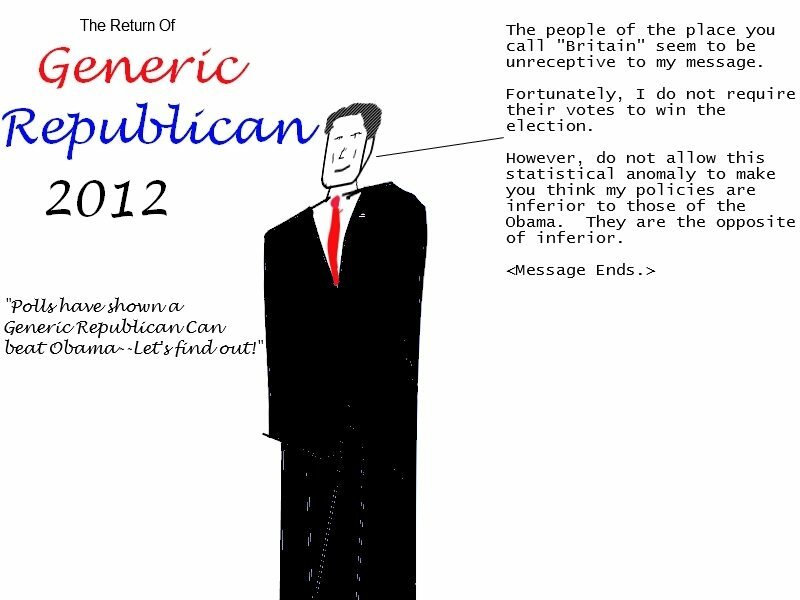 The only charismatic Republican I can think of is too undisciplined and arrogant to organize an intelligent campaign. The reason they are always going on about Reagan is because even after all these years, they have never found anybody half as charismatic as him to sell their contradictory policies. “The major issue of this campaign is the direct political, personal and moral responsibility of Democratic Party leadership –in the White House and in Congress — for this unprecedented calamity which has befallen us. They tell us they have done the most that humanly could be done. They say that the United States has had its day in the sun; that our nation has passed its zenith. They expect you to tell your children that the American people no longer have the will to cope with their problems; that the future will be one of sacrifice and few opportunities. Kind of a major shift, no? This must be some kind of hoax. In general, I suspect kids aren’t quite as malleable as people think, and more than ready to resist ham-fisted techniques, regardless of the message. I suspect that such efforts as the one you see above will be counterproductive. So, the point clearly isn’t that Republicans sugarcoat everything; sometimes they say optimistic things and other times they say pessimistic things. The reason for all this, I think, goes back to the American exceptionalism thing; the Republicans don’t believe much stuff about America being flawed; they want to talk about the flaws introduced by those who are in some way “alien” to America. The issue Perlstein explicitly raises is the matter of Climate Change–why are Republicans saying the science demonstrating it is false? One answer I can see is that they are all beholden to oil corporations. Another is that, as Perlstein says, they don’t want to hear they can’t use all the damn resources they please, if that is their wish. They feel, as the Governor of Louisiana said, that “Americans can do anything”. You might say that the Republican version of events is optimistic and blithe. “We can use all the resources we want, at whatever rate we like, as intended by God.” is their view–correct me if I’m wrong. On the other hand, the fact that people complain of climate change requires, in the Republican version of things, a conspiracy of international Socialists and Dictators who control the Universities, the Democratic party, and many media outlets. This is not optimism. Incidentally, I’ve written about this issue before, and I’ve always wondered: how many of the Republicans think of themselves as “lying for a cause”, and how many think it’s all completely true?